This classic picture book encourages young children to find nursery rhyme and fairy tale characters as they listen to the rhyming text. The text consists of short, repetitive phrases with only one rhyming sentence per page. The use of repetitive language makes this book an excellent choice for developing the language skills of very young children. Children enjoy exploring the detailed illustrations as they play “I spy” and make simple predictions about who they will see on the next page of the book. 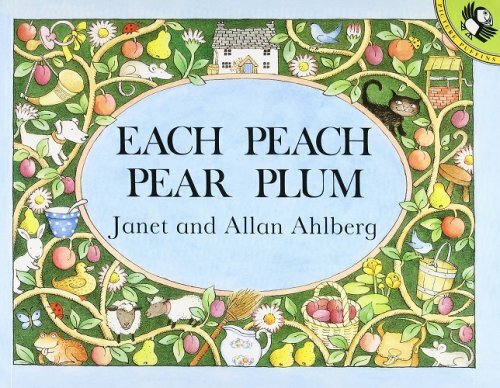 For further speech and language targets in Each Peach Pear Plum, see the list below.